HIV Testing Coordinator John Werning offers free, confidential hepatitis C tests that deliver results in 20 minutes. According to the Centers for Disease Control and Prevention, new cases of hepatitis C (hep C), a deadly viral infection that affects the liver, have nearly tripled in the United States over the course of the decade. Risk factors for contracting the virus include having HIV, using intravenous drugs, and being part of the baby boomer generation, characteristics that are common among clients of The Night Ministry. 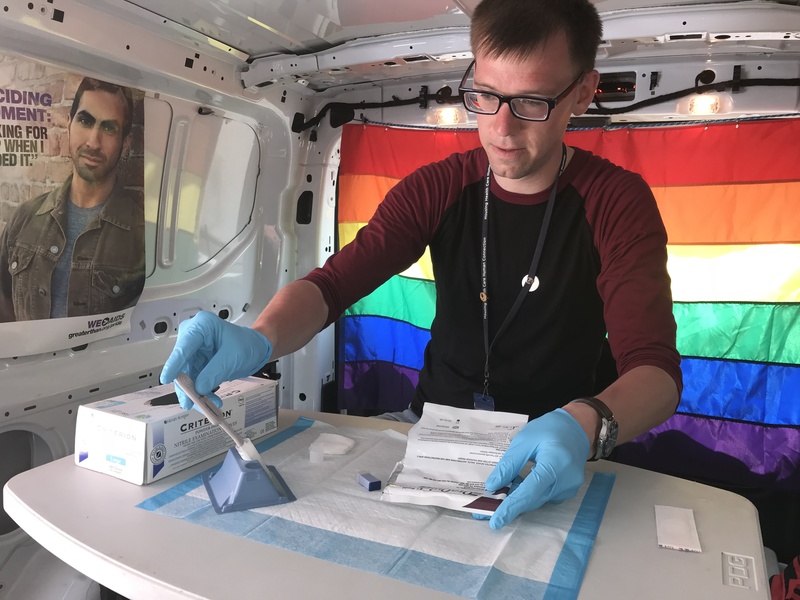 Last year, Outreach and Health Ministry staff administered more than 180 rapid tests for the hep C antibody.John Werning, HIV Testing Coordinator, has had to deliver the unfortunate news of a positive test result to a number of clients. And while an effective treatment is available, Werning said Illinois state policies mean it is out of reach for many. "Most of our clients who have health insurance have coverage through Medicaid. And if they aren't in late stages of liver damage or if they are using drugs, they won't get medication." The Night Ministry refers clients who test positive to service partners like The Hepatitis C Community Alliance to Test and Treat (HepCCATT). Maggie Kaufmann, HepCCATT Case Management Program Director at the University of Illinois at Chicago, said there are reasons for clients to seek medical attention even if Medicaid won't pay for their medication. "We try to work every angle we can to access treatment for them. We assist health care providers to pursue other avenues such as patient assistance programs," she said. "We also emphasize that continued engagement with their provider is important as they should be evaluated yearly for progression of liver disease." Werning said many clients express frustration about receiving a positive test result with no clear path toward treatment. But, he added, "Knowledge is power. You can protect your loved ones from exposure to hep C. And you still have the option to make lifestyle choices—changes in diet and not using drugs or alcohol, for example—that can mitigate damage to your liver."